Another classic type of pasta, Pizzoccheri Buckwheat is typical of northern Italy, specifically in the Valtellina valley. This scrumptious bag of specialty pasta, in particular, is from pasta maker Carlo Moro. Quite a unique and versatile pasta, instead of durum wheat flour, its main ingredients are buckwheat and whole wheat flour. Traditionally, you can serve it with cabbage, potatoes, butter, garlic, and Fontina and Parmesan cheese. Or if you want, you can also check out Nonna Carla’s scrumptious recipe from our Lombardy Nonna Box. 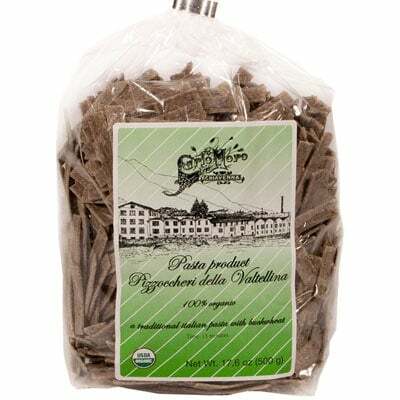 No time to waste, grab a bag of this lovely Carlo Moro product today!